Farm animals are a favorite motif to stitch for children and there are lots of cute patterns, both modern and vintage, to choose from. However, if you want your farm friends to be a little funky, these free patterns are for you! The shape and style is definitely not like any real animals I've seen and that's part of their charm. Maybe these animals don't like fitting in the traditional mold, or perhaps Old McDonald had an edgy grandson. I'm not sure, but I do know that kids of all ages will find them to be a little silly and lots of fun. They would be fun stitched on children's items, such as bibs, onesies or blankets. Or make a small wall hanging either in a hoop or as a mini quilt. They would also be adorable as a little garland. This easy garland could easily be done with the farm animals in place of the hearts. There's really no limit to how you might use them. And since these are a little unusual, making a more unique project with them would be perfect. Continue on to download the pattern and find ideas for stitching. You can download the Funky Farm Friends pattern as a JPG, then adjust the size and print it out. Print the designs directly onto water-soluble stabilizer or use your favorite transfer method. The patterns can be embroidered with any outlining stitch or you could fill them with satin or long/short stitch. Make the animals extra funky by choosing unusual stitches for outlining, such as coral stitch for the sheep, twisted chain stitch for the pig, fern stitch for the chicken or blanket stitch for the cow. Another way to make these animals more unique would be to use bright colors. 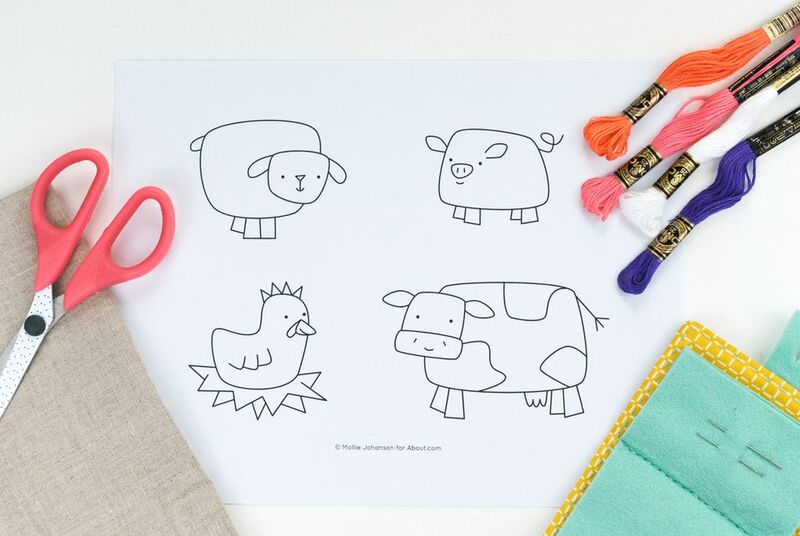 Why not embroider a purple cow, a hot pink pig or a glow in the dark sheep? For a finishing touch, type or write, then embroider each animal's sound it makes. You could even look up the sounds in another language, such as Spanish or Japanese and include a few different versions on the same embroidered piece. Please Note: These patterns are copyrighted © by Mollie Johanson and are licensed to About.com, Inc. The patterns are free for your own personal use and creating finished embroidery available for sale in small quantities. Please do not redistribute these patterns in any way.